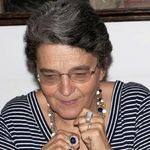 Maria Ida De Michelis, born in Venice (Italy) in 1951, is full Professor of plant physiology at UNI Milano since 1997. She acts as a reviewer for several international journals and research funding agencies and has organized several National and International meetings. She has been leader of national research projects. She has developed collaborations with various qualified laboratories in Italy and abroad. Her work has been the object of about eighty papers on international journals and monographies, and of several seminaries and lectures at national and international meetings. Her research focuses on the molecular mechanisms of regulation of plant plasma membrane H-ATPase and Ca-ATPase. She has contributed to demonstrate that the fungal toxin fusicoccin stabilizes the interaction of the C-terminus of the plasma membrane H-ATPase with 14-3-3- proteins and identified a new protein of Arabidopsis (PPI1, proton pump interactor, isoform 1) able to interact with the H-ATPase C-terminus activating the enzyme through a mechanism distinct from that of 14 3 3s. She has contributed to the identification, characterization and purification of a calmodulin regulated plasma membrane Ca-ATPase: is worth recalling the demonstration that the enzyme catalyses a Ca/H antiport. Her group has identified and cloned the first gene of A. thaliana plasma membrane Ca-ATPase (ACA8). Availability of ACA8 cDNA has allowed overexpression in yeast of wild type and mutant ACA8 used for a structure/function analysis of the mechanisms of autoinhibiton and of activation by calmodulin or by other factors such as for example acidic phospholipids: by this way her group has shown that the calmodulin binding site is localized in the cytosolic N-terminus and is partially overlapping an autoinhibitory site which exerts its action by interacting with the enzyme catalytic head.